The cultivator removes the weeds between rows of crops. Cultivators can have straight or curved "teeth", spring "teeth", or disks. 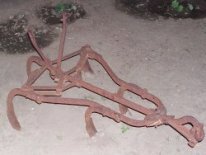 This cultivator is typical of the 1850s and would be drawn by a horse. It was replaced in the 1890's by larger cultivators which could be ridden. The removal of weeds between the plants was necessary for many reasons. The weeds took water and nutrients from the crop. The weeds also might contaminate the crop at harvest. A cultivator removes the weeds between the rows of crops. Prior to 1800s this was usually with done by hand with a hoe. 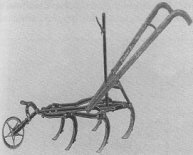 By the 1850s hundred of different types of horse drawn cultivators were made. Cultivators have straight or curved tines, spring tines or disks. By the 1890s larger cultivators with seats were available. Gradually, the disk cultivator replaced all the spike cultivators as it was could be pulled faster with motorized equipment. This is a curved tine cultivator. The depth of soil penetration is controlled by the placement of the front wheel. The lever provided an easy way an easy way to change the cultivation width.